Craig Gandolf of Cynthia Hurley French Wines. Craig Gandolf’s got a new and exciting position as National Sales Director for #CynthiaHurleyFrenchWines of West Newton, and he’s looking forward to someday expanding the import company’s select portfolio to include a few quality Spanish brands. Gandolf’s not shooting in the dark; for nearly two decades he was the director of Jorge Ordonez Selections, the largest U.S. importer of Spanish wines, and a Boston restaurateur. 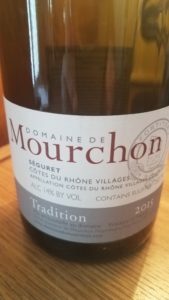 The Mourchon Tradition 2015 is a southern Rhone beauty. Gandolf’s broad industry experience and Spanish connections factored in President Robert Hurley’s decision to bring Gandolf on board in May 2018. For now though Hurley’s priority is recognizing small, well-run French operations and bringing their artisanal wines to the U.S. market. (Read more about the company, founded by Robert’s late wife Cynthia Hurley in 1984, at www.cynthiahurley.com). A view of the Domaine De Mourchon in the village of Seguret. I offered to open the bottle and taste it with him, but Craig politely declined. He said he was in between a lively morning workout at the gym and a long, slow afternoon walk with his dog. So we talked about a recent business trip he took to a Paris wine expo and the Mourchon Tradition teasingly resting before us. One of the ‘hot’ zones for wine values, said Gandolf, is the Rhone Valley, a region of 300 wine-producing villages stretching from Lyon in the north to Avignon in the south. The diversity of grapes and terroir provide winemakers with a broad viticultural palate for stylistic innovation, although mandated wine laws serve to maintain a strong sense of tradition reaching back centuries. Which brings me back to the Mourchon. Later that evening, the Wine Goddess, my wife Mary Lee, broiled two thick pork chops rubbed lightly with bread crumbs and spices, and added roasted potatoes and sautéed spinach to the meal. I uncorked the Mourchon to a nice array of bright raspberry and blueberry aromas and poured the garnet-colored liquid into the glasses. The first sip and swallow proved just as satisfying – a harmonious mix of black cherry, plum fruits and gamey spices, plus an appealing dry minerality on the extended finish. The texture was smooth throughout. I learned that the grapes for Mourchon Tradition are fermented individually in steel vats before being placed in concrete to age and “soften” for a period of 18 to 24 months. A final blend is then selected and bottled. There is no oak in the process; the resulting wine is a pure expression of the vintage, terroir and “culture raisonee” – natural and organic farming methods. Seguret, a hilly, medieval village of remarkable beauty, plays a vital role in the wine’s character. 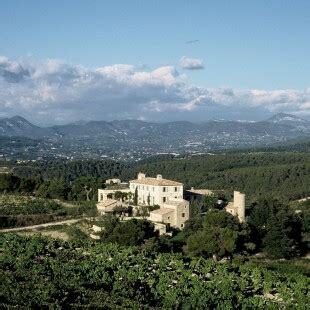 It is located in a sweet spot just north of the cru vineyards of Gigondas and is one of 18 CDRV villages (95 in all) known for producing consistent, quality wines with distinct traits. Thus, by law, Seguret is recognized as its own CDRV appellation on bottle labels. Mourchon Tradition 2015 and other Cynthia Hurley French Wines are available in several Greater Boston restaurants and at the following Massachusetts wine shops: Wine-Sense in Andover; Concord Cheese Shop; Savor in Gloucester, and Salem Wine Imports. Sign up for the company’s newsletter and featured wines at cynthiahurley.com/events/.